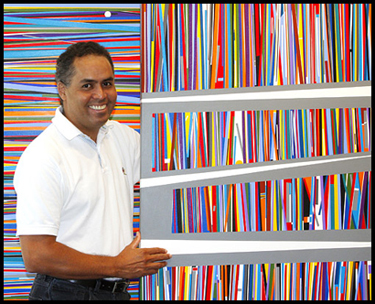 Venezuelan-born Miami artist Israel Guevara is predominantly known for his unique investigation of color through the use of bright colors and defined and overlapping lines, which speaks volumes of his versatility. His sophisticated yet playful presentation allows viewers to experience a constant interaction with his creations, an interaction that results in ever-changing colors, shapes, dimensions and even images. After a career in architecture, the self-taught visual artist became a full-time painter whose works, though mostly on canvas, range a variety of mediums. With an attractive and exciting résumé of diverse works, Israel has been invited to exhibit his talent at such prestigious locales as the Boca Raton Museum of Art, the Frost Art Museum and the Ninoska Huerta Gallery/ Biscayne Art House and the Geometric and MADI Museum in Dallas, Texas. Additionally, his work has been reviewed in various publications such as The Miami Herald and Florida Design’s: Miami Home & Decór, as well as by the Haute Design Network. "My work is an investigation of color, simple form and the development of the integration of light and space. To encourage the viewer to interact with my creations I recreate my personal, social and environmental experiences unto a variety of mediums."